The high octane, bullet hell shooter Devil Engine from DANGEN Entertainment is coming to Nintendo Switch and Steam. The game will be releasing on both platforms simultaneously on February 21st. We have the official announcement from DANGEN Entertainment below. 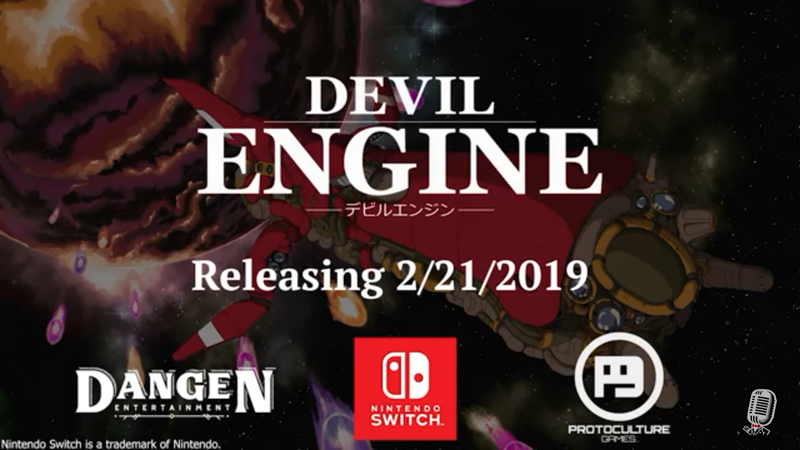 DANGEN Entertainment is pleased to announce the worldwide release of Devil Engine for Nintendo Switch™️ and PC (Steam) on February 21st! Triumph or Die! Devil Engine is a high octane, classic styled side scrolling shoot-em-up heavily influenced by the best in the genre from the 32-bit era, featuring a variety of incredible locations, beautifully hand-drawn pixel art, and a blood-pumping soundtrack that brings the dark future to life. Players will can expect fast-paced shooting through 6 stages, each with multiple bosses, utilizing 3 shot types, power ups, and burst bullet absorb to pave their way to victory. Fans of Sega Saturn and PC-Engine shoot-em-ups won’t want to miss Devil Engine. A last ditch effort to destroy what was once to be their savior. A final mission to eliminate a disastrous future. A single ship against Earth’s entire military. The Andraste is the only hope to defeat…The Devil Engine. – Power up 3 Shot Types, each with unique Bomb attacks, to destroy everything in your path. – Score point-multiplying combos and make use of a chargeable Burst ability to absorb bullets and escape demise. – Leave a wave of carnage across 6 incredibly detailed stages and 8 game modesto compete for score supremacy. – Accumulate points and spend them to unlock in-game features, such as shaders, additional music, stages and playable ships.